How many hate or bias incidents occurred on your campus this past year? Did any students opt out of filing formal charges? How many completed a formal resolution process, and what happened? Would you have liked to have other conflict resolution options? Social justice theory provides the lens for expanding our conception of student conduct administration, and the foundation for considering systemic changes in practice - changes that are vital to address the concerns and issues raised by an increasingly diverse student population. Using this lens, this book casts new light on existing principles and current practices; makes issues of power, privilege and oppression manifest; and offers a vision for expanding resolution practices to empower today's students to resolve their own conflicts. Complementing the ""Model Student Disciplinary Code"", this book opens up a whole new range of approaches and models that readers can adapt to their institutional circumstances. Starting from the principle that systems and models are vehicles through which to act on our values, and by focusing on such core values as the commitment to student development, freedom of expression, diversity, accessibility, individual rights and shared responsibilities in a community of learners, the contributors reveal the utility and contemporary relevance of a number of underutilized resolution practices. Part I provides a framework for transforming student conduct administration using conflict resolution methods and social and restorative justice practices. 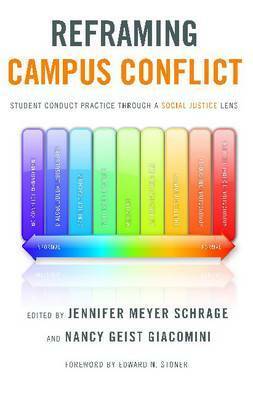 Part II, devotes a chapter to explaining each of the seven 'Spectrum Model Pathways' to conflict resolution that form the core of this book: Dialogue, Conflict Coaching, Facilitated Dialogue, Mediation, Restorative Justice Practices, Shuttle Diplomacy, and traditional formal student conduct processes informed by social justice theory. Part III provides practical application tools for the ideas presented in this text, including discussion of change management and assessment, and concludes with an overview of programs from across the country using inclusive conflict resolution methods in student conduct work. 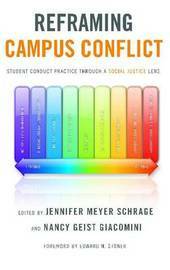 This is a book for anyone concerned about issues of access and justice for all students - regardless of race, sexual orientation, belief, or ability - and seeking to develop and implement restorative and safe practices for their campus community. Jennifer Meyer Schrage J.D., provides leadership to the University of Michigan's Office of Student Conflict Resolution within the Division of Student Affairs. Nancy Geist Giacomini Ed. D. is a private educator, mediator, facilitator and author based in Chester County, PA.